Beautifully engraved certificate from the Converse Rubber Shoe Company issued in 1922. 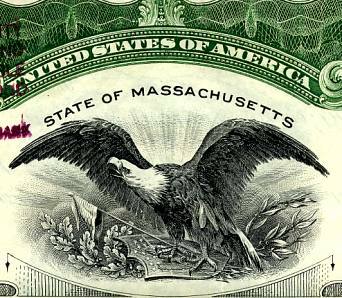 This historic document was printed by Columbian Bank Note and has an ornate border around it with a vignette of eagle standing on a shield. This item is hand signed by the Company's President and is over 95 years old. Marquis M. Converse started the "Converse Rubber Shoe Company" in 1908. Over ninety years later, the brand continues as a presence in the athletic shoe business. 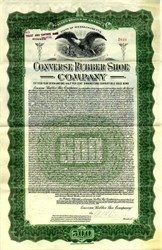 1908 - The "Converse Rubber Shoe Company" opens for business. 1917 - The first version of the sneaker now known as the "All Star" enters production. 1921 - Charles H. Taylor ("Chuck") hires on as a salesman and endorser. 1923 - The "Chuck Taylor" signature added to the All Star basketball shoe. 1935 - The "Jack Purcell" sneaker introduced by B. F. Goodrich... later to become a Converse product. 1966 - Converse starts adding color choices to the basic black and white "Chuck Taylor" All Star basketball shoe. 1970 - The suede "One Star" comes out.